Download the free plugin zip from our Plugins page. FYI: If you can't install the plugin using WordPress plugin installer, you may also use a FTP software to install the plugin. To install plugins with an FTP method: extract the plugin zip on your local computer then upload the plugin folder to your FTP server where you installed WordPress > wp-content > plugins folder. After, login to your WP Admin > Plugins to activate the plugin. If you want to use the default WordPress content editor for the popup content, then enter text/content in the WordPress editor. We recommend to use Themify Builder, Builder Lite (free), or any Themify theme (all Themify themes come with the builder). General: General pages such as home page, general pages, general single view, author pages, etc. Category Singles: Single post view of specific categories. Categories: Category view of specific categories. Post Types: Single post view of specific post types. Taxonomies: Archive view of specific custom taxonomies. 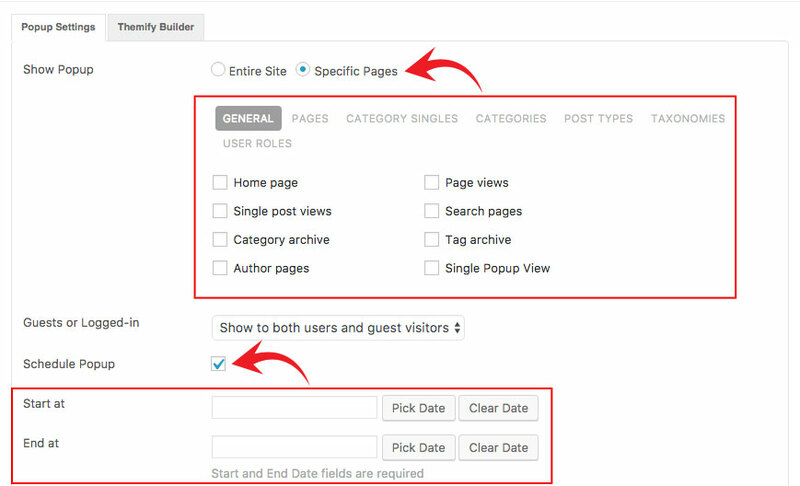 User Roles: Show popup to specific logged in user roles. Guests or Logged-in: Show popup either to guest visitors or logged-in users, or both. Schedule Popup: Show popup during a specific time period. If schedule popup option is checked, then pick the start and end date (see screenshot). Time Delay: Trigger the popup after a number of seconds (entering "0" will trigger the popup immediately). Page Viewed: Trigger the popup after the visitor views a number of page counts. Manual Launch: If manual launch is selected, popup will not be launched automatically. You would need to insert the popup shortcode manually. Refer to Manual Launch Popups for more details. Classic: Classic style will show popup with an overlay. Position: Choose the position of the popup. Overlay Color: Pick a color for the overlay. Slide Out: Popup will slide out without the overlay. Choose the position of the popup. Popup Dimension: Enter the desired popup dimension. Fullscreen: Popup will cover the entire screen completely. NOTE: Google might penalize sites with fullscreen popup on mobile. If you choose the fullscreen option, it is recommended to check "Mobile Disable" option to disable the popup on mobile. Open Animation: Select an animation effect when the popup opens. Exit Animation: Select an animation effect when the popup closes. Show Only Once: If this option is checked, popup will show only once or until the user's browser cookie is expired. Once you check the "do no display the popup again" checkbox, you will be able to specify when to expire the cookie. Auto Close: If this option is checked, you can specify the popup to close after a number of seconds. Mobile Disable: Mobile disable will not trigger the popup on mobile. Overlay As Close: If this option is checked, the user can click anywhere on the popup overlay to close it. Manual launch button is great when you want to showcase your content in a lightbox. This ensures that your users won't be bothered with an automated popup as they review your site (view demo). Link Button To: Select the popup that you would like the button to link to. Button Color: Select a built-in preset color style. Custom Background Color: Optional: if you want a custom background color, enter the color code or click the color picker beside the input to choose a color. Custom Button Text Color: Optional: enter or pick the color for custom button text color. Fullwidth Button: If this option is checked, it will display the button fullwidth. Additional Styles: The plugin stylesheet comes with the following additional button styles: outline, gradient, flat, rounded, and embossed. You can enter one or more additional styles (eg. 'rounded embossed gradient' will show the button with rounded corners, embossed style, with a glossy gradient overlay). If you have a custom CSS class that you want to add, you may enter it here as well. After the configurations are done, clicking "OK" will generate a shortcode in the editor. Now you may insert this shortcode anywhere where shortcode is supported (ie. post/page editor, sidebar text widget, Themify Builder's Text widget, etc.). Use with Themify Builder or Builder Lite (free), you can design popups on the frontend or at the backend with our drag & drop interface. 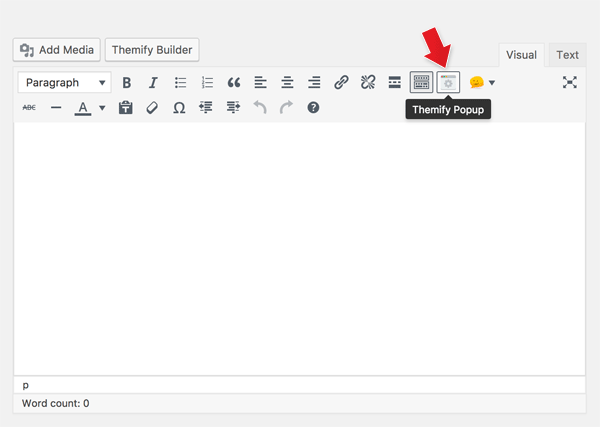 To use Themify Builder in the backend mode: on the Themify Custom Panel, click the "Themify Builder" tab. Then you can drag & drop modules on the layout. For more info on how to use the Builder, refer to the Themify Builder documentation. 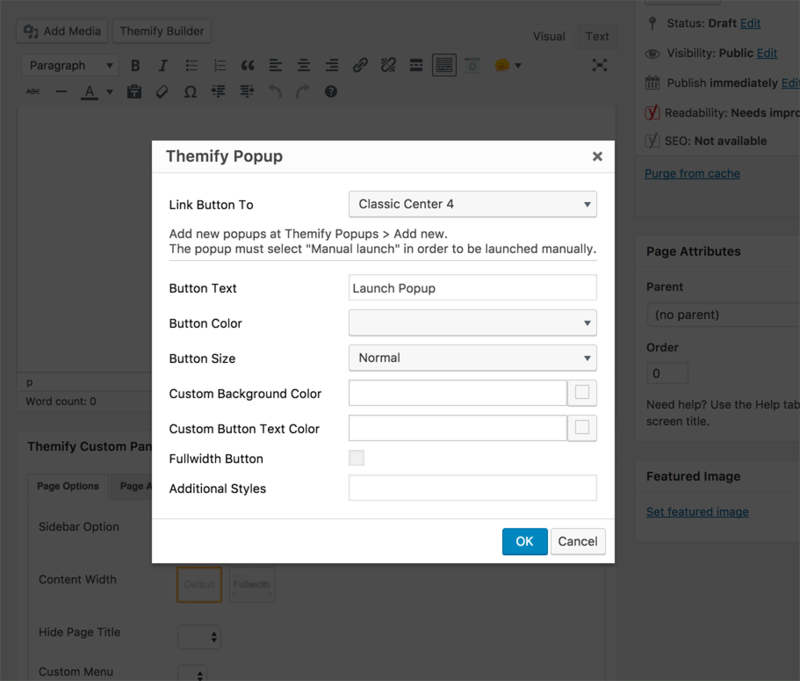 To use Themify Builder on the frontend mode: after you add the popup, click "View Post" which will direct you to the frontend, then click "Turn On Builder" to design the popup layout. 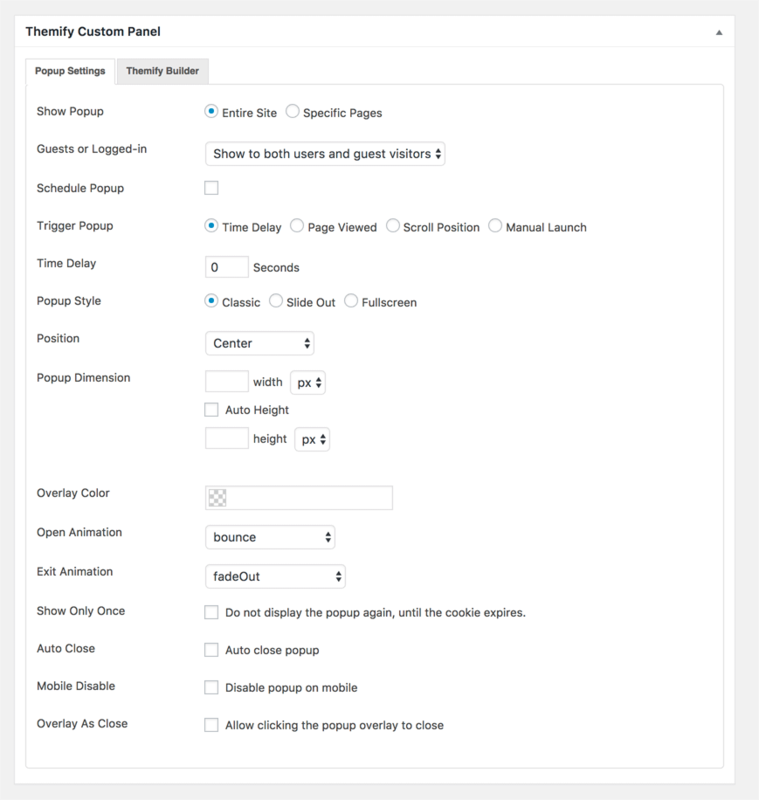 View the new post on the frontend, click "Turn On Builder", on the top admin bar, select the following: "Themify Builder > Layouts > Load Layouts", then click the "Themify Popup" sub-tab, and click a thumbnail to import the layout. Now you may edit the imported layout. We use Mailchimp newsletter services on our demo. You can sign up for free and it will allow you to send up to 2,000 subscribers. After you login, go to "Lists" (if you don't have a list, create a new list), then click the list in which you want to embed the newsletter sign up form. 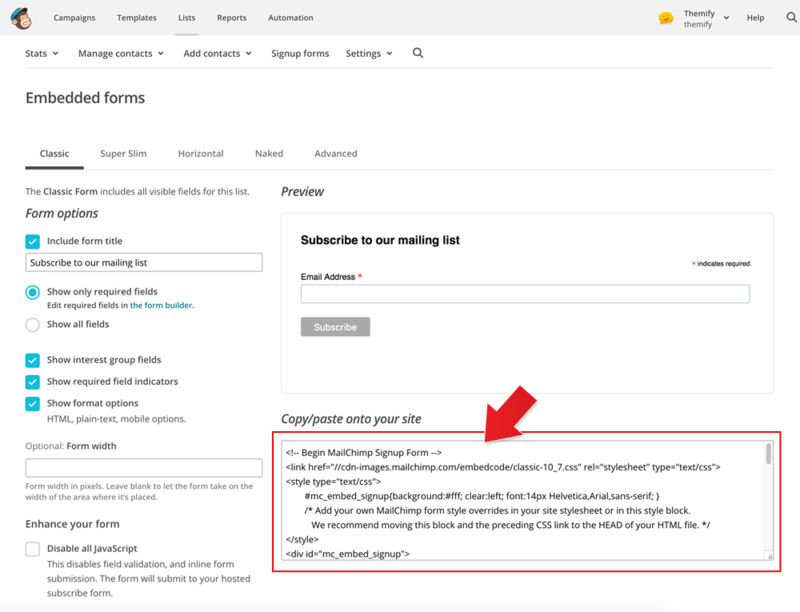 Then click on "Embed Forms"
To embed the subscription form in the WordPress editor: first click on the "Text" tab on the editor, then paste in the Mailchimp form code. To embed the subscription form via Themify Builder: drop in a "Plain Text" module and then paste in the Mailchimp form code. If the auto plugin update does not work, you may reinstall the Themify plugin by following the steps below. Reinstalling the plugin shouldn't affect the content/data because they are saved separately in the database. To be safe, you should backup your WordPress content (posts, pages, menus, etc.) before reinstalling it. To backup your WordPress content, go to WP Admin > Tools > Export and export all contents to a zip file. You may use WP Admin > Tools > Import to import these contents in the future if necessary. Download the latest plugin zip. Login to your site WP Admin. Go to Plugins (where WordPress lists all the plugins on your site). Deactivate the Themify plugin (plugin can not be deleted if it is active). Now click on the "Delete" button to remove the Themify plugin (the "Delete" link is located under the Themify plugin name). Remain on the Plugins page, click on the "Add new" button (located at the top of the page), click on the "Upload Plugin" link, upload the latest themify-[plugin-name].zip, and activate it (basically the same procedure as you would install a new plugin).